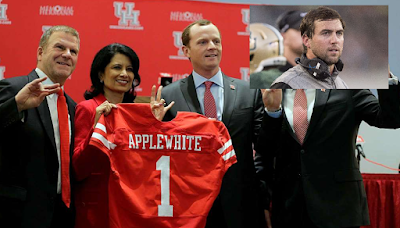 On January 6th of this year, the University of Houston hired two former Baylor assistant coaches in their football program. Most alarmingly, they hired former Baylor offensive coordinator, who was in the middle of the ongoing sexual assault scandal. Specifically, according to a January 2017 lawsuit, Briles is alleged to have told a recruit in a text message: "Do you like white women? Because we have a lot of them at Baylor and they love football players." This website first expressed our reservations about this hire on January 8th. On January 10th, we filed an open records request for "All records related to the hiring of Assistant Football coaches Kendal Briles and Randy Clements." On January 26, we reported on how the response to that request raised more questions than it answered. Beginning that evening, and continuing since, we've been sending U of H open records requests to get to the bottom of this mind-boggling hire. To date, except for a minor request for clarification last week, we have received zero response from U of H. It's been two months and three expired deadlines. We've never done this before, but we're filing an official complaint with the Attorney General's office. Bottom Line: One would think that a college football program, in hiring a coach who is alleged to have facilitated racially charged sexual assaults at a previous job, would be extra-transparent about the hiring process (at least if they didn't have anything to hide). Sadly, that doesn't seem to be the case with the University of Houston and Kendal Briles. So be it.